Fra Mauro was a 15th century Venetian monk, who was also a notable mapmaker. The Fra Mauro crater on the moon is named after him. 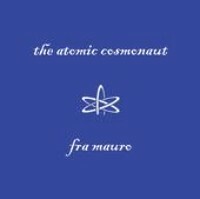 Fra Mauro is also the title of the latest album from Toronto based musician The Atomic Cosmonaut, aka Erik Culp (who also fronts space rock band Mind of a Squid). Each of the pieces on the album, form the title track on down is named after a feature of the moonscape, and the music is appropriate lunar in nature. Culp’s style is quite unique, and differs somewhat from his work with Mind of a Squid in being totally instrumental, and less “song-oriented”. The Atomic Cosmonaut mixes equal parts spacey ambient electronics with Sergio Leone soundtrack style guitar and experimental trip-hop rhythms. It’s got a laidback, cool, cowboys in space kind of vibe as cosmic analogue synth washes swirl around twangy guitar riffs. Although admittedly, this album also rocks a little more than his previous efforts too, thanks in part to the inclusion of drums on more tracks, taking the sound away from purely ambient, and more into rhythmic territory, as in the title track which opens the album with an explosion of synth and drums. Other tracks however, like Bullialdus, although still driven by an easy paced rhythm, focus more on mood and atmospherics, especially with the use of sampled recordings of the voices of astronauts landing on the moon. Each track though, develops it’s own mood, whether it be the fast paced, funky rocker Euclides, the slowly building space rock of Agatharchides, or the mysterious ambience of Palisa. The only minor criticism I have, is that some of the pieces are a little short (pieces range in length from 1:16 to 7:47. Euclides, for example, is a great little rocker, little being the operative word because it ends rather suddenly, just as it’s catching fire, at about the 1:42 mark. I so wanted there to be more! Admittedly, it’s a minor criticism, because Fra Mauro is really an excellent album overall. Fans of both progressive electronic music and space rock will find much to enjoy in its lunar atmospheres and grooves.